By Stephen Yates from U.S. Keen observers in Taiwan have noted a significant uptick in recent US statements of support. Some have seen the Trump administration as generally more favorable to Taiwan, given the President-elect’s willingness to receive President Tsai’s congratulatory phone call and given the President’s willingness to sign significant pro-Taiwan legislation into law without modification or caveat. Notwithstanding that general trend, with which I agree, the source and content of recent statements has indeed been notable. This strong statement was echoed by a spokesperson for AIT adding, “As we have said many times before, Taiwan is a democratic success story, a reliable partner and a force for good in the world.” Note the phrase, “force for good,” was a key message in US Secretary of State Pompeo’s January 10 Cairo remarks, reminding leaders in the Middle East that the US has been a unique force for good in their region and around the world. This reference puts Taiwan in good company and should be understood as a meaningful compliment. On the source of the original statement, some have asked whether it is significant that it came from the NSC spokesman. It was a little unusual that it came via Twitter, but it is not unusual for statements of administration policy in the national security realm to come from the NSC. In fact, it was President Obama’s NSC spokesman, speechwriter, and deputy national security advisor Ben Rhodes who somewhat broke the mold as the most prolific and authoritative spokesperson for that administration on national security. A White House policy statement does take precedence over a statement from a cabinet agency in terms of a statement of administration policy. Whether from the White House press secretary or from the NSC spokesman, it has the same effect. And the fact that statements of administration policy from the White House have been relatively few in this administration, this one stands out all the more. Understanding the significance of this statement, the natural follow on question is, why now? What motivated the White House to take this on rather than leaving it to the State Department or AIT alone? The simplest and most direct answer: China. The aggressive actions and statements from Beijing, especially in recent years under Xi Jinping, drove US Vice President Pence to issue his stark and strategic critique of the Communist Party of China’s role in it’s own country, in the world, and within the US itself. Add to that the aggressive tone of Xi’s New Year message to “Taiwan compatriots,” clearly intended to pressure Taiwan President Tsai Ing-wen in advance of her campaign for re-election, and it is understandable why the White House decided to issue a strong statement of support for Taiwan and rebuke Beijing’s aggressive posture. Over multiple US administrations, from Clinton to Trump, the US has issued statements calling for cross-Strait dialogue and peaceful resolution of differences. There are two elements that are different about the current statement from the Trump White House. First, it unequivocally places blame on the PRC side for current tension and hostility. That is significant. Second, it calls on Beijing to resume dialogue with the “democratically-elected administration on Taiwan.” That is more significant. It is essentially pressing Beijing to recognize the existence and legitimacy of a democratically-elected government in Taipei with which the US itself does not have official diplomatic relations. This is a major step in the direction of common sense and a peaceful future. No more pretending. No indirect negotiation via non-profit organizations. No misdirection by way of party to party negotiations. If peace, prosperity, and Taiwan’s democratic way of life are to be preserved, the only legitimate channel for negotiation is directly with the government leadership elected by and accountable to the people of Taiwan. The only point I would question, even criticize, in this otherwise excellent White House statement is the notion that any resolution of cross-Strait differences must be based on the will of the people “on both sides.” That is ridiculous. The Communist Party dictatorship in Beijing doesn’t even respect the will of the people on its own side. No way should we suggest it would be legitimate for the unelected leadership in Beijing to thwart the will of the free people of Taiwan, simply because the Communist Party already compromises the freedom of 1.3 billion Chinese people. 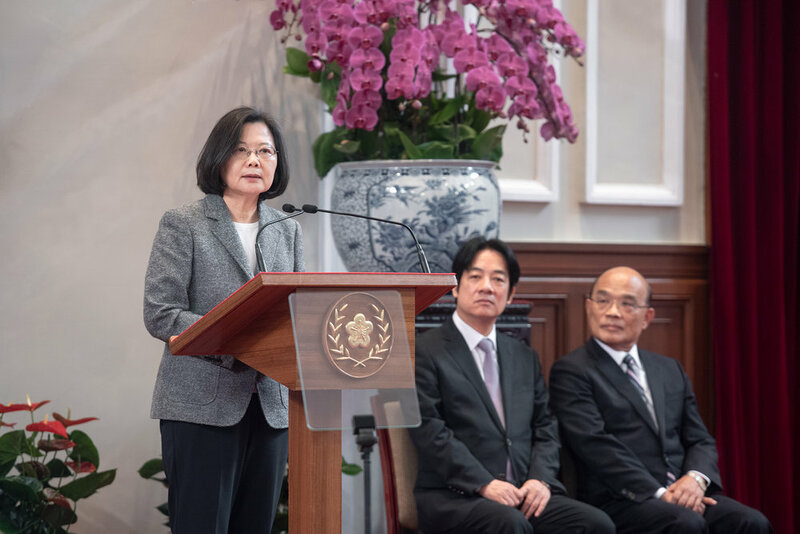 The only rational and moral US position should be that cross-Strait differences be resolved peacefully and with the assent of the Taiwan people. Period. Given the absolutely incendiary statement by PLA Lt. Gen. He Lei that followed the White House tweet, calling independence advocates “thieves,” “scum,” and “war criminals,” perhaps PRC belligerence will push the US further in the direction of even better policy towards Taiwan. Did Xi Accidentally Endorse Tsai's Re-Election?